It was a pleasant afternoon with the warm sunlight splashing the air with an abundance of gold when I made my way inside Professor Niaz Zaman's simple yet elegant house in Gulshan. As I sat down on the sofa taking preparation to take notes I saw an evermore familiar face of a man entering the doorway. I was naturally puzzled as I wasn't expecting him. However, I was also genuinely happy as he was none other than the editor of Star Campus Mr. Shahnoor Wahid. As soon as we were all comfortably seated and done with exchanging greetings and smiles I volunteered in starting off the day's conversation with Professor Zaman. Most of us would prefer to signify her as a professor of English at the University of Dhaka but this celebrated academician is also a well known English writer in Bangladesh. Other than writing articles on literature and folk art, she also excels in poetry and writing fiction. When asked about her academic life she told us of her versatile experiences as a student. Her first schooling concerned one year in Darjeeling. Later she came to study in St. Francis Xavier until her mother decided that she should settle for home schooling instead. It was not before several years of homes chooling that she went to attend standard six in Viqarunnisa Noon School and sequentially completed her I.A from Holy Cross College. She recalled her hostel days with profuse nostalgia as we saw her gaze become clouded with memories from the past. Although Professor Zaman was never unsure about her skills and the possibilities it could bring, she was made to sit for her B.A exams from the same college by her conservative parents, as she said with a smile. After the completion of her B.A degree she worked on her parent's reluctance to let her go and study in an university with great persuasion and eventually managed to get herself admitted in the M.A class at the University of Dhaka. I sat there spellbound listening to her struggles and the numerous attempts to dodge them in becoming what she had to. In conversation with this warm soul the issue of her passion for teaching came up very candidly. She told us that her teaching career started earlier during her B.A years when she taught for three months at Viqarunnisa. At this point she shared with us a very special memory of getting herself into the habit of wearing saris since. She also substituted for a sister in Holy Cross College awhile. According to professor Zaman, the break in her teaching career came with the proposition to join Chittagong University as a lecturer in 1969. 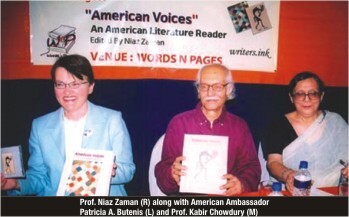 And in 1972 Niaz Zaman signed up as a teacher for the Oxford of the East, Dhaka University. After having learnt about her academic achievements I was eager to know about the writers that inspired and enticed her as a student and a teacher of English literature. In response to my question, she smiled meaningfully at us and confessed that it would be pretentious to deny Shakespeare's unanimous appeal in the world of English literature. The three of us had a brief discourse on Shakespeare's timeless elixir in all phases of life and professor Zaman concluded that Shakespeare has the most readable and teachable text indeed. Shortly after when we were served tea and cakes, Shahnoor bhai sparked off a food for thought! He questioned the all-embracing capability of 90's literature students compared to the 70's. He smiled sardonically at me and waited for Professor Zaman's reply. I kept my fingers crossed as my compeers and I belonged to either sides of the time divide. Therefore, I was praying hard and hoping beyond hope as a minority. I would say Niaz Zaman was kind in her judgment. She explained that in general considering all the facts and faults, the students of 70's were comparatively better. She claimed that in the seventies people who came to study literature belonged to an elite section of the society and had immense knowledge of what they were studying. But due to the expansion of education in nineties students from humble backgrounds with no fundamental knowledge of English let alone literature came to study at the university. Then again, today's students who are intelligent and have adequate knowledge about their subject constituents are unmistakably superior to their fore bearers. Soon the debate was patched up and I insisted on learning about her story of becoming a writer. I was personally fond of her writing and couldn't help but ask her about the details of her writing career. She thanked me for my interest and started telling us about how it all started. As a child, professor Zaman read whatever she could gather from her father's library books and magazines. She sent her pieces to children sections of newspapers and wrote for a number of magazines like 'Young', 'Herald' and 'She'. She also had her stories published both in English and Urdu in the college magazine. Her story, 'The Dance' won an award in the short story competition occasioned by Asia Week. She also wrote for 'Holiday' and acted as the literary editor of 'New Age' from September 2003 to January 2006.Niaz Zaman is also known for her erudite translations. When asked if she would like to be introduced as a writer or a translator to her readers, her reply was inclusive. She told us that writing had been practiced by her since a very tender age. She wished to reach out to a wider readership. Thus she chose translation. It was nearly the end of our delightful afternoon when Shahnoor bhai urged professor Zaman to say a few words about her publishing house, Writer's Ink. She gladly told us that Writer's Ink started it's journey` in August 17,2005. Professor Zaman confided in us the fact that she felt it a duty towards the older as well as the younger writers to bring out some of their rare and illustrious works. So far, Writer's Ink has individually and coherently published many enjoyable reads. All in all, my parting question to this graceful lady was what message she would like to impart to the young English writers of Bangladesh. She affectionately told me that to write well one has to write what one knows. As for writing in English it requires excellence in the language itself. Reading is a prerequisite in becoming an accomplished writer in any language. For Bangladeshi writers living abroad, she suggested, "know the culture of your country and learn the literature of your own language, integrate yourself to your roots before you start writing". The afternoon sun had slid down further in the western horizon when I came out of her house.